I often write about how things are going with the children at Good Shepherd's Fold, but I also wanted to write a brief update about our four children. They are all doing well here and enjoying life in Africa. Elijah, our first born, has started taking guitar lesson from our Ugandan friend, Jonathan. They have a 45 minute or so lesson 3 days a week since Jonathan lives very close. (Jonathan is the young man who is the intern at our church, so we are also enjoying the opportunity to have him stay for dinner and discuss the sermon series or theology or Ugandan culture.) Elijah is really enjoying learning and often says he wishes he had a lesson on the off days. Elijah is also continuing to play drums at church and in the Hosanna Choir. He is becoming our musician. 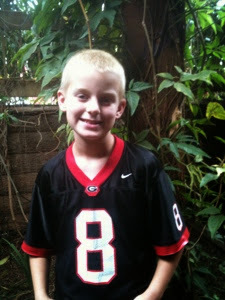 He also loves playing basketball and soccer with the kids here at GSF and has made many friends. Esther is just as creative as always and enjoys making up games and stories with her younger brothers. Esther has also started really enjoying reading. She is often found with a flashlight in bed staying up late reading the Boxcar Children books. 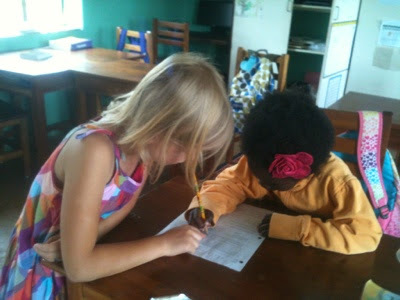 She also loves teaching, and helps Amelia with her math each day. Maybe she will grow up to be a math teacher like her mama. Ezra continues to enjoy animals and anything to do with science. He likes to make experiments and study the critters he catches. Today we have a pair of millipedes and and a toad. 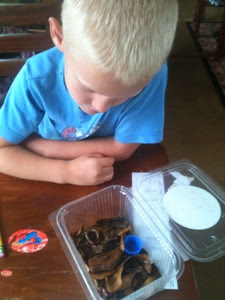 He is trying to create natural habitats for them and study what they will eat, how they behave, etc. 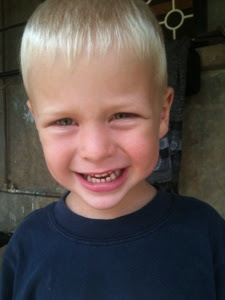 Zeke has become a hilarious, creative little boy who enjoys making everyone laugh. Recently he has begun talking about an imaginary "Grandma Joseph" who basically tells him whatever he wants to hear. This "Grandma Joseph" tells him not to take naps and that he will have 10 birthday parties and other such things. He also likes to look in the mirror and make faces at himself. It is always entertaining to hear him talk to himself as he plays. We are so thankful for this funny little boy. We have areas where we are praying for God's work in each of our children's hearts, but we are glad to see the ways they are growing and maturing here. Please pray for our children, the other missionary kids and all the children here at GSF, for God's work in each of their lives.